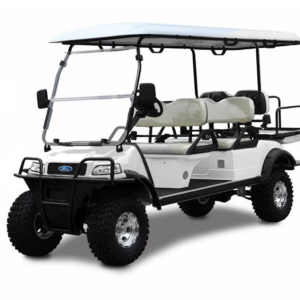 Whether used for shuttling staff on a mine site in Queensland or a retreat in Adelaide , the high clearance Ford Catalina 4 Seat is designed for comfort and reliability. 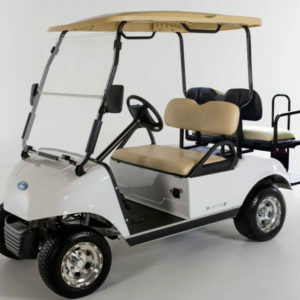 Standard features include high torque shunt wound 48 volt electric motor, 10 inch alloy wheels with 22 inch rolling diameter tyres, heavy duty Trojan batteries, full perimeter steel chassis with 15 year warranty, an electrics pack that includes head lights, tail lights, Dash mounted USB jack, 12 volt dash mounted power outlet, and an onboard 48 volt to 12 volt reducer to allow fitting of 12 volt accessories. 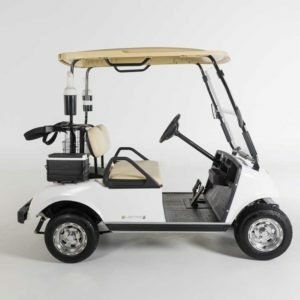 Options and upgrade model features include tow bar, Lithium battery pack, 5kw AC motor and 4-wheel hydraulic brakes. 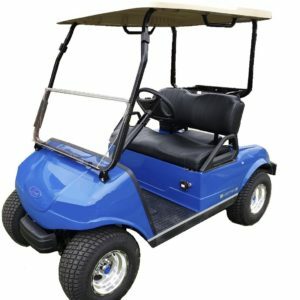 A safety glass windscreen with electric wiper washer, 2 or 3-point seat belts, amber beacon light tool boxes and custom cabinets are available and rain covers, seat covers and custom paint options are also available. For a complete list of models, options and accessories please contact us.